Nutec Systems, Inc. has been a leader in the industrial thermal ink jet market, and we are proud to continue our leadership by providing quality integration of product handling, printing and vision inspection systems. The BlackBox Series is a revolutionary concept for completing your critical marking and coding requirements on primary and secondary packaging. The BlackBox is designed to simplify your vision inspection equipment requirements on the line. The design enables you to choose the functions that your line requires and build your BlackBox by choosing from a menu of features including: printing, vision inspection, Track & Trace and even Quality Assurance Software. A single source touch screen input ensures that what you are printing will be inspected correctly. A high resolution, small character thermal inkjet printer utilizing HP® printing technology. The printer portion of the BlackBox Series can be configured to include from 1-12 print heads. Intelligent ink management allows you to utilize any TIJ ink and SI cartridge while maximizing the inherent qualities of each ink. Inks are available for a wide variety of substrates from porous to non-porous, including plastics, metals and even glass. Our intelligent features allow you to monitor ink consumption from 42 ml cartridges – 1000 ml bulk ink systems. The BlackBox Series can include either a smart sensor to detect print presence / perform pattern matching, or a smart camera for OCV print character and code verification. You can choose the level of inspection that is required to meet your specifications. Our vision inspection equipment & software assumes all scans are “bad” until they are confirmed “good” for a failsafe inspection. Line control can be included to initiate an alarm or reject based on your SOP. Nutec’s Track & Trace software can be included. Our Track & Trace software has been proven in the field since 2007. The program has successfully been used to adjudicate cases of diversion in a court of law. Our unique software, which is based on the parent child relationship, is the only software that has successfully completed the entire loop of tracking a product in the field. 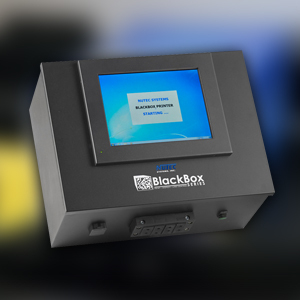 The BlackBox Series can be configured with cheQAssure™, Nutec’s patented software suite. A software suite for batch verification of GS1 and non-GS1 barcodes.